This article is about the religious holiday. For the 1973 military conflict, see Yom Kippur War. Yom Kippur is traditionally spent in the synagogue, fasting and praying. Painting by Maurycy Gottlieb (1878). Significance Judgment day for individuals and all people. Day of Atonement for sins, and for the Golden calf. Related to Rosh Hashanah, which precedes Yom Kippur, and Sukkot, which follows Yom Kippur. Yom Kippur (Hebrew:יוֹם כִּפּוּר meaning Day of Atonement) is the holiest day of the year in the Jewish calendar. It falls on the tenth day of Tishrei - the seventh month of the Jewish calendar. In the Bible, the day is called Yom HaKippurim (Leviticus 23:27) and it is said to be one of the Yamim Noraim (meaning: "Days of Awe"). As the Jewish day of Atonement, Yom Kippur's central themes are repentance and reconciliation with God and one's neighbors. According to the Mishnah, it is said that "the Day of Atonement" can absolve people from sins against God, but not from sins against a fellow human unless the pardon of the offended person be secured (Mishnah tractate Yoma 8:9). Hence the custom of terminating all feuds and disputes on the eve of the fastday (or in the ten-day period between Rosh Hashanah and Yom Kippur). Even the souls of the dead are said to be included in the community of those pardoned on the Day of Atonement. It is customary for children to have public mention made in the synagogue of their departed parents, and to make charitable gifts on behalf of their souls. The rites for Yom Kippur are set forth in the sixteenth chapter of Leviticus (cf. Exodus 30:10; Leviticus 23:27-31, 25:9; Numbers 29:7-11). It is described as a solemn fast, on which no food or drink are to be consumed, and on which all work is forbidden. Additionally, washing, wearing cosmetics and leather shoes, and conjugal relations are prohibited (Mishnah tractate Yoma 8:1). The day is commemorated with a 25-hour fast and intensive prayer. Total abstention from food and drink usually begins half-an-hour before sundown (called "tosefet Yom Kippur," the "addition" of fasting part of the day before is required by Jewish law), and ends after nightfall the following day. Although the fast is required of all healthy adults, fasting is specifically forbidden for anyone who might be harmed by it. Yom Kippur is observed in different ways in different Jewish communities. Sephardic Jews (Jews of Spanish, Portuguese and North African descent) refer to this holiday as "the White Fast" because they have the custom of wearing only white clothing on this day, to symbolize their "white" (pure) desire to free themselves from sin. Ashkenazic Jews, though acknowledging the origins of the holiday as a day of rejoicing, tend to take a more somber, solemn attitude to the day. In Biblical times, sacrifices were offered in the Temple of Jerusalem (see below). There is a commandment to eat a large and festive meal before Yom Kippur starts. Virtually all Jewish holidays involve a ritual feast; in the case of Yom Kippur, the meal that precedes the holiday supposedly makes the fast even more strenuous, thereby fulfilling the injunction "you shall afflict yourselves" in Leviticus 23:27. Traditional foods consumed during that meal include kreplach and rice. Many Orthodox men also immerse themselves in a mikvah (ritual bath). Men (and some Reform and Conservative women) don a Tallit (four-cornered prayer garment) for evening prayers, the only evening service of the year in which this is done. Many married men also wear a kittel, or white shroud-like garment, which symbolizes inner purity. Prayer services begin with the prayer known as "Kol Nidre," which must be recited before sunset, and follows with the evening prayers (ma'ariv or arvith), which include an extended Selichot service. 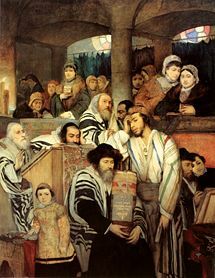 The morning prayer service is preceded by litanies and petitions of forgiveness called selichot; on Yom Kippur, many selichot are woven into the liturgy. The morning prayers are followed by an added prayer (musaf) as on all other holidays, followed by mincha (the afternoon prayer) and the added ne'ilah prayer specifically for Yom Kippur. Yom Kippur comes to an end with a recitation of Shema Yisrael and the blowing of the shofar, which marks the conclusion of the fast. The Torah is read during the morning and afternoon prayers (Leviticus 16 and 18, respectively); the Book of Jonah is read as the haftarah in the afternoon. Depending on the nusach (version) of the prayers, some communities pray continuously from morning until nightfall, while others include a short break. Every prayer includes the vidduy (confession). While the Temple was standing in Jerusalem (from Biblical times until 70 C.E. ), the Kohen Gadol (High Priest) performed a complex set of special services and sacrifices for Yom Kippur. These services were considered to be the most important parts of Yom Kippur, as through them the Kohen Gadol made atonement for all Jews in the world. During the service, the Kohen Gadol entered the Holy of Holies in the center of the Temple, the only time of the year that anyone went inside. Doing so required special purification and preparation, including five immersions in a mikvah (ritual bath), and four changes of clothing. Prior to Yom Kippur, the Kohen Gadol was sequestered in the Parhedrin chamber in the Temple, where he reviewed the service with the Temple sages, and was sprinkled with spring water containing ashes of the Red Heifer as purification. The Talmud (Tractate Yoma) also reports that he performed the incense offering ritual in the Avitnas chamber. Morning (Tamid) Offering: The Kohen Gadol first performed the regular daily (Tamid) offering—usually performed by ordinary priests—in special golden garments, after immersing in a mikvah and washing his hands and feet. Garment Change 1: The Kohen Gadol immersed in a special mikvah in the Temple courtyard and changed into special linen garments, and washed his hands and feet twice, once after removing the golden garments and once before putting on the linen garments. Lottery of the goats: At the Eastern (Nikanor) gate, the Kohen Gadol drew lots from a lottery box over two goats. One was selected "for the Lord," and one "for Azazzel" (an evil spirit or demon). The Kohen Gadol tied a red band to the goat "for Azazzel." Bull as Personal Sin-Offering: The Kohen Gadol leaned (performed Semikha) and made a confession over the goat on behalf of himself and his household, pronouncing the tetragrammaton. The people prostrated themselves when they heard. He then slaughtered the bull as a chatat (sin-offering) and received its blood in a bowl. Incense Preparation: The Kohen Gadol ascended the mizbeach (altar) and took a shovel full of embers with a special shovel. He was brought incense. He filled his hands and placed it in a vessel. (The Talmud considered this the most physically difficult part of the service, as the Kohen Gadol had to keep the shovelful of glowing coals balanced and prevent its contents from dropping, using his armpit or teeth, while filling his hands with the incense). Incense Offering: Holding the shovel and the vessel, he entered the Most Holy Place. In the days of the First Temple, he placed the shovel between the poles of the Ark of the Covenant. In the days of the Second Temple, he put the shovel where the Ark would have been. He waited until the chamber filled with smoke and left. Sprinkling of Blood in the Holy of Holies: The Kohen Gadol took the bowl with the bull's blood and entered the Most Holy Place again. He sprinkled the bull's blood with his finger eight times, before the Ark in the days of the First Temple, where it would have been in the days of the Second. The Kohen Gadol then left the Holy of Holies, putting the bowl on a stand in front of the Parochet (curtain separating the Holy from the Holy of Holies). Goat for the Lord as Sin-Offering for Kohanim: The Kohen Gadol went to the eastern end of the Israelite courtyard near the Nikanor Gate, laid his hands (semikha) on the goat "for the Lord," and pronounced confession on behalf of the Kohanim (priests). The people postrated themselves when he pronounced the tetragrammaton. He then slaughtered the goat, and received its blood in another bowl. Sprinkling of blood in the Holy: Standing in the Haichal (Holy), on the other side of the Parochet from the Holy of Holies, the Kohen Gadol took the bull's blood from the stand and sprinkled it with his finger eight times in the direction of the Parochet. He then took the bowl with the goat's blood and sprinkled it eight times in the same manner, putting it back on the stand. Smearing of blood on the Golden (Incense) Altar: The Kohen Gadol removed the goat's blood from the stand and mixed it with the bull's blood. Starting at the northeast corner, he then smeared the mixture of blood on each of the four corners of the Golden (Incense) altar in the Haichal. He then sprinkled the blood eight times on the altar. Goat for Azazzel: The Kohen Gadol left the Haichal and walked to the east side of the Azaryah (Israelite courtyard). Near the Nikanor Gate, he leaned his hands (Semikha) on the goat "for Azazel" and confessed the sins of the entire people of Israel. The people prostrated themselves when he pronounced the tetragrammaton. While he made a general confession, individuals in the crowd at the Temple would confess privately. The Kohen Gadol then sent the goat off "to the wilderness." In practice, to prevent its return to human habitation, the goat was led to a cliff outside Jerusalem and pushed off its edge. Preparation of sacrificial animals: While the goat "for Azazzel" was being led to the cliff, the Kohen Gadol removed the insides of the bull, and intertwined the bodies of the bull and goat. Other people took the bodies to the Beit HaDeshen (place of the ashes). They were burned there after it was confirmed that the goat "for Azazzel" had reached the wilderness. Reading the Torah: After it was confirmed that the goat "for Azazzel" had been pushed off the cliff, the Kohen Gadol passed through the Nikanor Gate into the Ezrat Nashim (Women's Courtyard) and read sections of the Torah describing Yom Kippur and its sacrifices. Garment change 2: The Kohen Gadol removed his linen garments, immersed in the mikvah in the Temple courtyard, and changed into a second set of special golden garments. He washed his hands and feet both before removing the linen garments and after putting on the golden ones. Offering of Rams: The Kohen Gadol offered two rams as an olah offering, slaughtering them on the north side of the mizbeach (outer altar), receiving their blood in a bowl, carrying the bowl to the outer altar, and dashing the blood on the northeast and southwest corners of the Outer Altar. He dismembered the rams and burned the parts entirely on the outer altar. He then offered the accompanying mincha (grain) offerings and nesachim (wine-libations). Musaf Offering: The Kohen Gadol then offered the Musaf offering. Burning of Innards: The Kohen Gadol placed the insides of the bull and goat on the outer altar and burned them entirely. 'Garment change 3'; The Kohen Gadol removed his golden garments, immersed in the mikvah, and changed to a new set of linen garments, again washing his hands and feet twice. Removal of Incense from the Holy of Holies: The Kohen Gadol returned to the Holy of Holies and removed the bowl of incense and the shovel. Garment Change 4: The Kohen Gadol removed his linen garments, immersed in the mikvah, and changed into a third set of golden garments, again washing his hands and feet twice. Evening (Tamid) Offering: The Kohen Gadol completed the afternoon portion of the regular (tamid) daily offering in the special golden garments. He washed his hands and feet a tenth time. The Kohen Gadol wore five sets of garments (three golden and two linen), immersed in the mikvah five times, and washed his hands and feet ten times. Sacrifices included two (daily) lambs, one bull, two goats, and two rams, with accompanying mincha (meal) offerings, wine libations, and three incense offerings (the regular two daily and an additional one for Yom Kippur). The Kohen Gadol entered the Holy of Holies three times. The tetragrammaton was pronounced three times, once for each confession. A recitation of the sacrificial service of the Temple of Jerusalem traditionally features prominently in both the liturgy and the religious thought of the holiday. Specifically, the Avodah ("service") in the musaf prayer recounts the sacrificial ceremonies in great detail. In Orthodox and most Conservative synagogues, a detailed description of the Temple ritual is recited on the day, and the entire congregation prostrates themselves at each point in the recitation where the Kohen Gadol (High Priest) would pronounce the tetragrammaton. (These three times, plus in some congregations the Alenu prayer during the Musaf Amidah on Yom Kippur and Rosh Hashanah, are the only times in Jewish services when Jews engage in complete full-body prostration, with the exception of some Yemenite Jews and talmedhei haRambam). A variety of liturgical poems are added, including a poem recounting the radiance of the countenance of the Kohen Gadol after exiting the Holy of Holies, traditionally believed to emit palpable light in a manner echoing the Bible's account of the countenance of Moses after descending from Mount Sinai, as well as prayers for the speedy rebuilding of the Temple and the restoration of sacrificial worship. There are a variety of other customs, such as hand gestures to mime the sprinkling of blood (one sprinkling upwards and seven downwards per set of eight). In some Conservative synagogues, only the Hazzan engages in full prostration. Some Conservative synagogues abridge the recitation of the Avodah service to varying degrees, and some omit it entirely. Conservative services generally omit prayers for the restoration of sacrifices. Reform and Reconstructionist services omit the entire service as inconsistent with modern sensibilities. Yom Kippur is considered the holiest of Jewish holidays, and its observance is held even among the majority of secular Jews who may not strictly observe other holidays. Many secular Jews will fast and attend synagogue on Yom Kippur, where the number of worshippers attending is often double or triple the normal attendance. In Israel, public non-observance (such as eating or driving a motor vehicle) is taboo. In Israel on Yom Kippur there is no broadcast television, no public transportation, and the airports are closed. There is no commerce of any kind in the Jewish areas. Since the roads in Jewish communities are free of motor vehicles on the time of the holiday, many secular Jews or non-Jewish individuals use the opportunity to ride the bicycle. Thus Yom Kippur has the nickname "Festival of Bicycles." This custom, which gained popularity in the recent decades, is especially popular on the eve of Yom Kippur. Most Christians do not regularly observe this holiday as they do not consider this day as part of the New Covenant; however, many Christian theologians do recognize the relationship of Yom Kippur and Judgment Day. Yom Kippur is considered to be the pre-text of what is to come, a foreshadowing of the end of times when they believe that Christ will judge humankind and forgive or condemn accordingly. Amish Christians observe a Fast Day on October 11, a Gregorian date which falls around the Hebrew date of Yom Kippur. According to Sunni tradition, Prophet Mohammad observed the Ashura fast in Mecca, as did the local population where it was a common practice from pre-Islamic times. When Prophet Muhammad led his followers to Medina, he found the Jews of that area fasting on the Day of Ashura, or Yom Kippur. At this juncture, the fast of that day became mandatory for the Muslims. However, numerous Sunni traditions in Sahih Muslim and Sahih Bukhari confirm that fasting on Ashura was abandoned by Prophet Muhammad when the fasting of Ramadan was mandated. Ibn Hajar al-asqalani, in his commentary on Bukhari's collection, says that the obligatoriness of the fast was superseded by fasting in Ramadan, a year after his migration to Medina. Today, Sunnis regard fasting on the 10th of Muharram as recommended, though not obligatory. Conversely, Shias regard fasting on that day as undesirable though not strictly forbidden. ↑ Biblical Holidays: The Hebrew Calendar Retrieved April 13, 2007. ↑ A tallit is normally worn only during the day. Although the practice of wearing it on Yom Kippur has many other contemporary symbolisms and interpretations, in traditional interpretation it is worn in honor of the Divine Presence that is especially present on this day. ↑ "Sounds of The City," article from Israel Insider Retrieved October 14, 2005. ↑ Diego D. Sausa, Kippur - the Final Judgment: Apocalyptic Secrets of the Hebrew Sanctuary (Fort Myers, FL: The Vision Press, 2006, ISBN 0-9788346-1-5). This page was last modified on 7 October 2016, at 14:50.